Fifty years, 11 Doctors and 45 tracks, this is the release that Doctor Who fans have been waiting for.... Assembled after years of research and trawls through dusty archives and libraries it's a compilation of the very special music that has accompanied the Doctor over his travels through time and space from William Hartnell in 1963 to present day Matt Smith. From Ron Grainer's iconic theme realized by the BBC Radiophonic Workshop's Delia Derbyshire to Murray Gold's orchestral tapestries, this is a sci-fi musical saga. The esteemed collection of composers featured include Tristram Cary, Brian Hodgson, Dudley Simpson, Geoffrey Burgon, Paddy Kingsland, Roger Limb, Malcolm Clarke, Keff McCulloch, Dominic Glynn, John Debney and more. 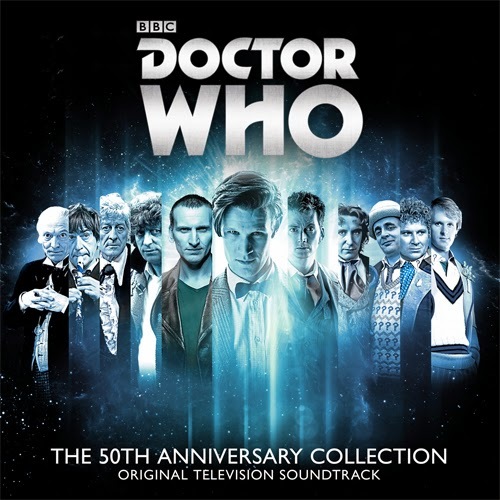 The set includes liner notes from Doctor Who composer Mark Ayres on the history of music in the series and details of the episodes. A lot of iconic music in Doctor Who. Its a shame the album drops in February.